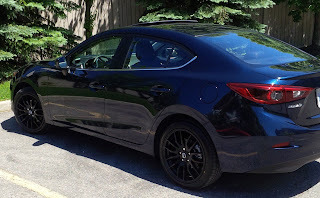 The 2016 Mazda 3 GT has an extra 30 horses and 18 inch wheels. It has 6-spd automatic with sports mode and shift paddles. The Bose sound-system has no distortion and better midrange than the 2013 version. I added side extensions from the Aero package to compensate for the extra height of the wheels. The driving dynamics are perfect. Most cars have factory wheels in summer and ugly steel wheels in the winter. I reverse that with dark alloy wheels in summer and factory silver alloy in winter. I wish there were fewer lumbering SUVs on the roads. An SUV is a light truck with lipstick. It rides high above the road, blocking the view of the road ahead or shining bright lights in the rear view mirror.